Light the grill. 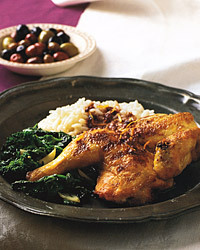 In a food processor, puree the butter and olives with the anchovy paste, orange zest, orange juice, garlic, and pepper. With a rubber spatula, scrape the butter into a small bowl and refrigerate. Rub the hens with oil and cook over moderate heat for 12 minutes. Turn and cook until just done, about 12 minutes longer. Remove the hens from the grill and serve with the rice. Top each serving with 2 tablespoons of the flavored butter, letting the butter melt over both the hen and the rice. You might grill some eggplant slices and drizzle them with balsamic vinegar to go with these hens. Sautéed broccoli rabe with garlic and a sprinkling of Parmesan would also match the Italian mood. The saltiness of olives and anchovies can make the wrong wine appear coarse and too alcoholic. A Rosé is the perfect choice. If you can find one from Sicily, buy it. If not, pick a bottle from Navarre in Spain or from the south of France.